This year, we’ve had a tremendous number of cards reprinted. This doesn’t count the reprints in regular sets or the Masterpieces in Kaladesh. Also, the Standard Showdown packs are adding to the numbers of cards in circulation. Take a moment and think about this list. Every card you have, every card you purchase, runs the risk of a reprint. I’ve talked before about how hesitant I am to speculate on a large quantity of cards because the reprint train is never stopping. 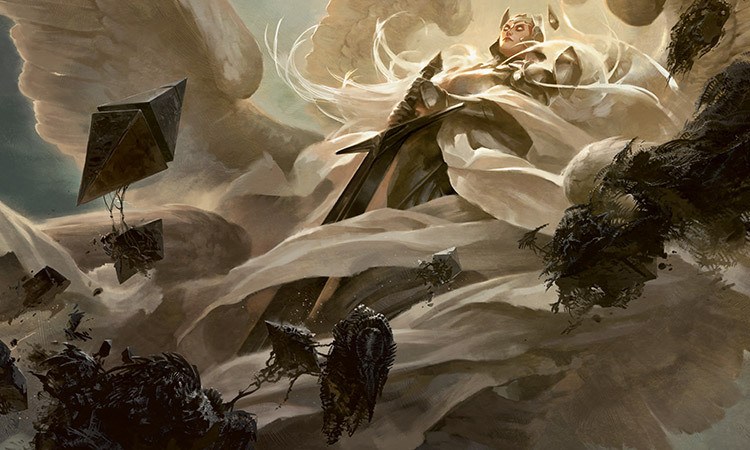 We already know that next year has another round of Modern Masters in March, as well as a Commander anthology in June. The only truly safe cards are those on the Reserved List, and it doesn’t matter if you agree with the philosophy, it’s one they are sticking to. I also admit that I’ve totally given up on predicting what they will do when it comes to reprints. Putting Iona, Shield of Emeria in both the FTV and the Modern Masters last summer is a move that perplexes me beyond anything else. At the same time, we are back to one rotation per year, which conversely makes Standard a lot more appealing for speculative purposes. So what’s an aware, educated Magic financier to do? Everyone who’s tried to make money off this game has their horror stories and a box full of cards that should have paid off but never did. I don’t want to highlight anyone else’s misses, though I can think of them. I confess to owning more than 50 Prophet of Kruphix, though. If you have a spare playset or two of a card, your exposure is limited. If you want to go crazy deep and pick up a couple hundred copies, you’re putting a lot of money at risk, especially if it’s a card that might get reprinted. Long-term holds are basically crapshoots. I traded for thirty copies of Thespian’s Stage when it was new and less than a dollar, and I had to dodge a reprint in every casual-oriented set for it to get to the $3 it’s at now. Believe me, I had confidence in the long-term appeal of the card, but I also knew how easily it would be added to just about anything. It’s a truism that Standard foils are a trap. Standard players don’t generally feel the need to foil out a deck as often as Cube, Commander, Modern, or Legacy players do. If you think a card is going to have appeal in non-Standard formats, and you’re willing to get in at a higher number, then foils are far safer. It’s not a guarantee, not at all, but it’s harder to print foil versions. On the list above, only Eternal Masters and Conspiracy 2 had foil versions of cards, and the From the Vault foiling is so unpretty that many collector-players stay away. Here’s the caveat, though: future Masterpiece sets are a dark cloud hanging over future prices. We’ve had lands, and we currently have artifacts. This leaves us creatures, spells, and enchantments. Perhaps one set will be instants, and another sorceries. Wouldn’t be surprising. Picking up a Masterpiece version of a card generally puts a ceiling on the previous foil versions. Foil Chromatic Lantern from Return to Ravnica will never be more expensive than the Masterpiece version. I’m surprised that the Invention version of Sol Ring has a price so close to the Judge version. This is perhaps the most important rule when it comes to reprints. Sometimes, you’re going to get hit. Even when your card starts to show signs of growing, something happens and it stays worthless. Accept this. It’s going to happen. It’s not just about a missed spec, it’s something that could have been amazing but instead it’s just cardboard that you can’t even light on fire effectively. If you’re going to play this aspect of Magic: the Gathering, you have to be prepared to not just be wrong. That’s bad enough. You have to be ready for your card to start to take off and then circumstances change and your card craters. Imagine having a stack of Ruinous Path, and then in Shadows over Innistrad, they decided to reprint Hero’s Downfall. That’s a gut punch right in the wallet. Strictly better reprints are rare, as are emergency bannings, but they are factors you have to be ready for. Or a stack of Planar Outburst into the printing of Fumugate. It doesn’t even have to be a reprint to get you a failed spec. I disagree with a lot of this. Long term specs are still viable, you just need to know where to look and use the announcements of products to plan your purchases. Standard/Modern cards that are being talked about/tested but haven’t seen top 8 results yet. Very short windows here. Cards like Selfless Spirit and about 10 other standard 2 drop creatures come to mind. These are your safest bet to be able to flip large quantities of. But you need to have quick outs and be willing to sell into the “2nd” spike. An example of this is buying Selfless Spirit at $2-$3 and selling at $5-$6, knowing the card could hit $8-$10, but letting the last 10% go to the next guy as many of you writers like to put it. To take advantage of short-term specs, you either need good connections or be extremely good at card/meta evaluation. Mid-Term Specs: In my opinion this is where most of the specs are drying up. This used to be your tournament staples and sideboard cards that would shift due to the meta… But tournament metas seem to be wide open right now and yes… reprints are are going to hit tournament staples WAY harder than they will casual foils or even in demand EDH cards. If you can predict Meta-Game changes, I still think mid-term specs are okay if you are dealing in staples and are diversified enough to take advantage of whatever shift may occur. Camera time is also a big factor for Mid-Term specs ultimately becoming successful. Long-Term Specs (my favorite!!! ): This is still the reserved list and First Printing Foils and cards that are hard to reprint. Think Nostalgia here. Diversification is also key. Don’t be an idiot and go all in on 1 foil… Pick up a wide range of popular, first printing foils that have established archetypes. Cards that shrug off reprints and that also have increased upside for the foils are even better. Examples of cards like these that come to mind from recent years are Doubling Season, Glimmervoid, Nykthos, Shrine to Nyx, Noble Hierarch, Birds of Paradise, etc. Even if every single one of those cards gets reprinted in supplemental product… The original foil copies aren’t going to be pulled out of peoples foiled commander decks, cubes, etc… Therefore, the price on them isn’t going anywhere. In fact, as more people are exposed to the non-foils and end up with a deck they would like to begin “foiling-out”, Foil versions of cards like Doubling Season, Birds of Paradise and various lands actually increase when non-foil reprints occur. This doesn’t take place immediately… But this is a Long-Term Speculation right? I’m not saying buy Ravnica Foil Doubling Season right now, but it was $35 for 2-3 years, now it is $65-$75. There are PLENTY of $20-$40 foils that could hit $60-$100 in the next 2-3 years. There will be even more foils that go from $5-$10 to $20-$30 in the next 2-3 years. I’ll even throw out 2 FREE PICKS!!! Duskwatch Recruiter and Nissa, Vastwood Seer have been happily adopted by the EDH crowd. They are both flip cards from odd sets that don’t make sense to reprint any time soon, especially in foil. Nissa has an SDCC promo, but those are very niche and the price of that is already $60. Currently I’m seeing Nissa Foils sell for around $15-$20 and Duskwatch Recruiter foils around $2-$4. I personally think that Nissa will be $30-$40+ and Duskwatch Recuriter will be $5-$8+ within 2-3 years. I could be wrong about Nissa and Duskwatch Recruiter Foils… But even if I am… I still suspect that they are extremely safe picks. Maybe they only go up $5 and $1 respectively… But do you see the foils cratering if they get reprinted? I don’t. That is what makes a safe long-term spec. Yeah, this article is not ENTIRELY wrong, but it sure seems wrong-headed. To begin with, I think the bullet points you make are precisely the things Wizards was trying to accomplish with its aggressive reprinting policy. Namely: (1) discourage people from buying out large quantities of cards for speculation purposes; (2) push speculation into premium versions of cards, which does not hurt players; and (3) stop people from thinking this is a sure-fire investment opportunity. And even for all of that, it’s not like you can’t still make money off this dumb game. Douglas is correct: you need to pay attention to when reprint-heavy sets drop and plan accordingly. Think of it like this: the life cycle of a (non-reserve) card is probably now only measured in a year or two rather than decades when it comes to price growth. You also need to keep your eyes peeled for cards that are hard to reprint, have combo potential, are Modern/Legacy playable, etc. Just because WotC is now finally enforcing something of a price ceiling on cards with the threat of reprints does not mean you can’t make bank by buying a card at $1.00 when you suspect it’s going to hit $5.00 or more in a year or so. Actually, I think it probably means *exactly* this. I picked up 8x fire sale playsets of Hardened Scales last year. Was that a bad spec? I don’t think so. There will be LOTS and LOTS of Hardened Scales from here on out. Good luck predicting the one they don’t reprint and not blowing all your potential profits on a dozen wrong predictions along the way. A smart investor hedges bets, right? I agree with the core message of this article. I already stopped foilspeculating after Zendikar expiditions ruined my investment of foil KTK fetch playsets. Now the reprint mania is taking even bigger form it is reason for me to abandon this ship altogether. My current finance strategy is simple: liquidity. Keep stocks low; sell, restock, sell, restock as fast as possible. Aim for about 30 percent margins. Yes, I lose to possible 1000 percent gains on speculation, but 30 percent is still great.